At 9:30 p.m. on August 21, 1986, a cloudy mixture of carbon dioxide (CO2) and water droplets rose violently from Lake Nyos, Cameroon. As the lethal mist swept down adjacent valleys, it killed over 1700 people, thousands of cattle, and many more birds and animals. Local villagers attributed the catastrophe to the wrath of a spirit woman of local folklore who inhabits the lakes and rivers. Scientists, on the other hand, were initially puzzled by the root cause, and by the abrupt onset, of this mysterious and tragic event. Lake Nyos is located in western Cameroon, adjacent to Nigeria, in the elbow region of west Africa. 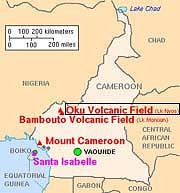 It lies within the Oku Volcanic Field, at the northern boundary of the Cameroon Volcanic Line, a zone of crustal weakness and volcanism that extends to the southwest through the Mt. Cameroon stratovolcano. The Oku Volcanic Field contains numerous basaltic scoria cones and maars. Lake Nyos itself occupies a maar crater which formed from a hydrovolcanic eruption 400 years ago. There are about thirty similar lakes in the region. Lake Nyos covers an area of about 1.5 square kilometers and is over 200 meters deep. This region of western Cameroon averages about 2.5 meters of rain each year. In the rainy season, the excess lake water escapes over a low spillway cut into the northern rim of the maar crater, and down a valley toward Nyos village. The water in Lake Nyos is normally a beautiful, deep-blue color. The post-eruption photo shown here, however, is composed of murky reddish brown water which apparently formed by the oxidation of iron-rich bottom waters that were carried up to shallower lake levels during the August 1986 event. The CO2-rich cloud was expelled rapidly from the southern floor of Lake Nyos. It rose as a jet with a speed of about 100 km per hour. The cloud quickly enveloped houses within the crater that were 120 meters above the shoreline of the lake. Because CO2 is about 1.5 times the density of air, the gaseous mass hugged the ground surface and descended down valleys along the north side of the crater. The deadly cloud was about 50 meters thick and it advanced downslope at a rate of 20 to 50 km per hour. This deadly mist persisted in a concentrated form over a distance of 23 km, bringing sudden death to the villages of Nyos, Kam, Cha, and Subum. One of thousands of dead cattle that died from CO2 asphyxiation at Lake Nyos on August 21, 1986. Courtesy of J.P. Lockwood, USGS. The bodies of those that died were generally devoid of trauma. Most victims appeared to have simply fallen asleep and died from asphyxiation. Many died in their beds. One survivor was Joseph Nkwain from Subum. He was awakened at about midnight by a loud noise. WHAT WAS THE MECHANISM THAT TRIGGERED THIS TRAGIC EVENT? After investigating the site of the disaster, scientists were divided into two camps on the mechanism of rapid CO2 expulsion: (1) CO2 could have burst through the lake as the result of a sudden gas eruption, or (2) CO2 could have accumulated slowly in the lower part of the lake, only to be released abruptly by the overturning of the bottom waters by some unknown mechanism. It had been known for years that the water in Lake Nyos was extremely enriched in dissolved CO2. The lake overlies a volcanic source, which appears to release CO2 and other gases. However, most of this gas does not escape into the atmosphere, but rather dissolves into the bottom waters of the lake. At a depth of over 200 meter, the sheer weight of the upper lake levels exerts considerable pressures on the bottom waters. This confining pressure allows CO2 to dissolve into the bottom waters without escaping to the surface, in much the same way that the cap on a carbonated beverage prevents CO2 from bubbling out of its container. At a depth of 200 meters, water can hold 15 times its own volume in CO2. It has been estimated that every liter of water in the lower part of the lake may have contained between 1 to 5 liters of CO2! On August 15, 1984, a similar CO2 "eruption" occurred thirty kilometers away in Lake Monoun, killing 34 people. Investigators from the U.S. concluded that this event was from the CO2-rich bottom waters being overturned by a landslide, an earthquake, or abnormally heavy rains. American investigators were convinced that the same thing happened at Lake Nyos two years later. However, many European scientists were just as convinced that the Lake Nyos tragedy was the direct result of a gas-rich volcanic eruption. Most experts now favor the idea that the gas was released when the lower layers of the lake were somehow brought up to the surface. There is little or no evidence that a landslide or an earthquake initiated the event. Instead, many scientists believe that the rapid accumulation of rainwater in the lake was responsible for overturning the bottom waters. The rainwater may have been blown to one side of the lake by strong August winds. Being denser than the warmer lake water, the rainwater mass would have descended down one side of the lake, thus displacing the bottom waters. This convective overturn resulted in the ascent and decompression of the bottom water, thus causing the dissolved gas to come out of solution (exsolve) and bubble upward at dramatic speeds. The bubbles themselves may have lowered the overall density of the gas-water mixture resulting in even greater rates of ascent, decompression, and exsolution. The result was a rapid and violent EXPULSION of CO2. So much gas escaped from this single event, that the surface level of Lake Nyos dropped by an entire meter. Today, large polyethylene pipes have been placed into Lakes Nyos and Monoun with the sole purpose of siphoning water continuously from the lower layers to the surface. This will allow the CO2 dissolved in the bottom waters to slowly bubble out as the water rises to the surface, thus preventing a similar tragedy in the future.